5 – Your words say one thing, but your body says another. Have you ever walked away from meeting someone new and thought, “I just don’t trust that person.” You probably don’t know exactly why but there was something they did or said that made you a little nervous. Sometimes it’s an obvious thing like a terrible handshake (if you’re a real estate agent with a bad handshake that should be your top priority – make sure you have a dry, reasonably firm and full palm handshake. Limp, wet, or fingertip handshakes are terrible and will not instill confidence or trust in the person you meet). Often it’s not something as obvious as a horrible handshake. It could be something that is not necessarily noticed consciously: a mismatch between what someone says and what their body says. It can be that you sense they are distracted or nervous. Or, it could be that they are telling a lie and you just don’t know why or about what. It doesn’t matter what your voice says if your body is saying something different. Reduce the chances that your body language doesn’t match by being fully present with the person you’re speaking with. Avoid the temptation to look away from them, fidget or scratch your face in the middle of speaking. Focus on what they are saying not the fight you had with your teenager before you left the house. Most importantly, be yourself. Be the best you possible – but be you. Deliver your words with confidence and your body should follow. If you don’t know the answer, let them know you’ll find out but don’t pretend to know. Trust is not a rational thing. We want to believe that we trust others for sensible reasons but it’s just not true. We trust someone who is good looking more than someone who is less attractive. 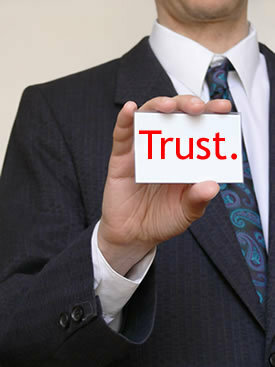 We trust someone we see on a regular basis over someone we have just met. We trust a celebrity on TV more than our neighbour. There are no rational reasons to trust in these situations but that’s how we’re wired. Start by taking a personal assessment. Have you not been doing precisely what you say you’ll do? Who are you associating with and what is their reputation? Do you believe you’re the best person to serve your ideal client? Take a look at what you look like and, finally, assess the authenticity of your message, and your own belief in your message. It’s possible one or more of these things are causing other people to wonder if they can trust you.